When getting organized, go the extra mile and select organizing products and storage solutions you love. When you do, you’ll find it easier to maintain order because you’ll enjoy—and stick with—your new organizing systems. So splurge on the cheerful, colored file folders instead of settling for plain vanilla manila. Invest in storage bins and baskets that make you happy and reflect your sense of style. 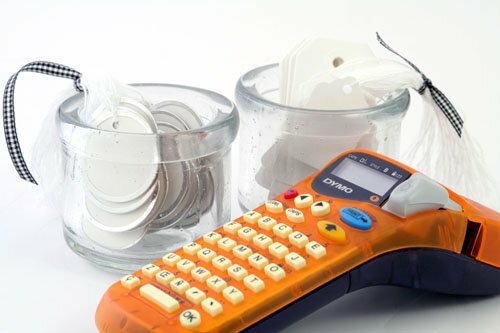 Last but not least, invest in labeling supplies such as a label maker, tags and pretty ribbon or twine to give your organizing projects a finished, professional look. You’ll love your space all the more, and be more encouraged to keep it organized going forward. 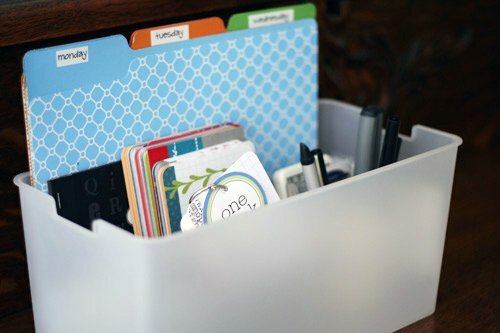 What are your favorite organizing products and storage solutions? Please share your favorites in the comments below. I’d love to hear from you! I love using empty cassette containers to store my die cuts. That’s a fantastic idea, Sue! Thanks for sharing it with us. I love IRIS clear boxes. I use mostly the shoe box size and the next size larger for fabric projects, kids’ toys & out of season clothing. You can see the contents, but I also label them. Storables carries them for a very reasonable price. Great solution – thanks for sharing Linda! I like using Ball wide mouth jars and paint the lids with chalk paint. That way you can write on the top of the lids and change as needed. There are extra large Ball jars as well as medium and small sizes. What a fun idea to paint the lids with chalkboard paint – love that!! I keep my pasta in glass jars – I could put the cooking time on the lid with chalk. Thanks for the idea! Thanks for the link Mimmie. That site is lovely! I LOVE to use the boxes made to store photos. I watch for them to go on sale for 3 for $5 and scoop up as many as I can. They come in amazing colors and prints. I purchased all black, white, and red combinations to use to organize my craft room. The boxes have prints: swirls; plaids; flowers; small white dots on black; even a heringbone print. I switch the lids around to make the color combinations more fun. Thanks, Lois. This is a great idea!